General Director of the JSC “SVAROG”. Full member of the World Academy of Sciences for the Complex Security. “Lazur” technology that was firstly proposed and developed by the JSC “SVAROG” is based on the combined action of ultraviolet radiation and ultrasound in water and sewage disinfecting units. This paper provides the substantiation of the effectiveness of this method and presents new experimental results on the comprehensive performance and microbiological tests of production-run samples of “Lazur – M” – series units. These tests were performed in the specialized laboratories of the Russian Federation, the Republic of South Africa, Australia, and New Zealand. Key words: radiation dose, disinfection of water and sewage, pathogenic microorganisms, “Lazur” technology, ultraviolet, ultrasound. Over the last decades, numerous outbursts of diseases of population caused by the presence of pathogens of protozoa etiology in potable water have been observed in different regions of our planet . Among these diseases, lambliasis and cryptosporidiosis should be mentioned first of all. The watery diarrhea is the major symptom of these diseases. It is noteworthy that cysts of lamblii and cryptosporidium oocysts possess more pronounced resistance to the action of disinfecting agents such as chlorine and ozone conventionally employed at waterworks as compared with bacteria and viruses. Hence, the transfer of the pathogenic organisms in point most often occurs through the potable water satisfying qualifying standards with respect to coliform bacteria. One of the main reasons behind the pollution of water sources with pathogenic organisms responsible for intestinal protozoa is the discharge of raw or of insufficiently purified waters. Therefore, the investigations directed to the development of effective methods of disinfection of natural waters and sewage relating to lamblia cysts and cryptosporidium oocysts are really topical. For the purification of sewage on the territory of the Russian Federation, sewage tanks and constructions of mechanical purification (grids – sand heads and clarifying basins) in regional area centers, and aero- and biological stations in towns are employed. To purify sewage of separately located buildings, small-size treating plants (KU-200, 400, 700; BIO-50, 100, 200) are used. The systems including mechanical purifying facilities, biological core pools, percolation beds, and reflux beds are also applied. For the disinfection of the so-called purified sewage, chlorine and sodium hypochlorite are mainly employed. However, the facilities of mechanical and biological purification do not provide the complete desinvasion of sewage. The investigations of the last few years have shown that the method of ultraviolet (UV) irradiation provides the most effective way of water desinvasion [2, 3]. 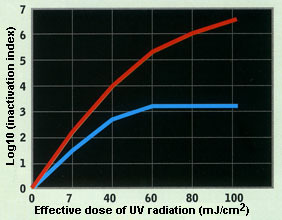 The effectiveness of disinfection by ultraviolet depends on the quality of water under treatment. The presence of organic and inorganic substances reduces the effectiveness of UV irradiation because these substances may absorb a part of UV radiation; in addition, suspended particles of insoluble inorganic and organic substances shield microorganisms from being hit by UV rays . It was found that the effective inactivation of cryptosporidium oocysts proceeds due to irradiation with UV light in the spectral range of 250 270 nm. Hence, gas discharge lamps of low and medium pressure may be applied for disinfection . 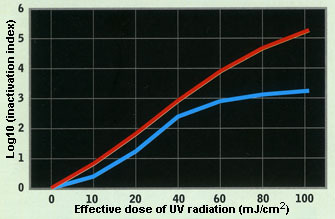 The techniques of water treatment by UV irradiation employed at present in the Russian Federation are insufficient for the effective destruction of pathogenic microflora. The current standards for UF flux densities of 16 20 mJ//cm2  and of 28 30 mJ//cm2  for domestic and industrial sewage do not provide the effective inactivation of pathogenic microflora. Moreover, an increase in the resistance of microflora with respect to the action of chlorine, ozone, and ultraviolet should be also taken into considerations. This circumstance relates to the natural evolution process. Microbiologists in the leading scientific centers of America, Asia, and Europe point to the fact that over the last 15 - 20 years the resistance of the pathogenic microflora to the action of chlorine has grown by 5 times, to the action of ozone – by 2 to 3 times, and to the action of UV irradiation – by 4 times . With due account for a further increase in the resistance of spores, viruses, and protozoa microorganisms to the aforementioned factors of water and sewage disinfection, this fact means that it is necessary to set such effective levels in designing of specific systems, which take into consideration the dynamics of the above mentioned resistance growth. 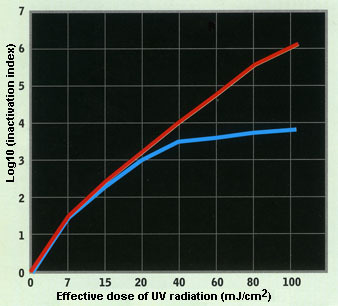 This is the reason behind the fact that in economically developed countries the standard minimal dose of UV radiation has been set to be not less than 40 mJ//cm2 and, for newly designed stations of water and sewage treatment, the dose of UV radiation is planned to be from 70 to 100 mJ//cm2. With due account for these reasons and also with the purpose of further decrease of specific energy consumption for the disinfecting of water and sewage, the ever growing interest is paid to the development of the effective methods of combined action of different physical and chemical disinfecting means and techniques [1, 8, 9]. One of such combined methods of water/sewage treatment was developed in the mid of 90-th of the last century; these methods make use of simultaneous action of ultrasound and ultraviolet to a medium being treated [8 - 10]. The corresponding technology based on this method was conventionally named as “Lazur” technology. The treatment of water/sewage is performed by the UV irradiation at the wave lengths of 253.7 and 185 nm at a flux density of no less than 40 mJ/cm2 and by the ultrasound at a power density of about 2 W/cm2 as well as by acoustic vibrations. 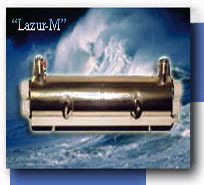 The proposed technology was successfully implemented and tested in the modular type bactericidal units of “Lazur-M” series (Fig. 6). Fig. 6 Stations for Disinfection of Potable Water and Sewage. In the course of water treatment by ultrasound from a transducer arranged directly inside the body of the chamber of ultraviolet irradiation, short-living vapor-gaseous cavities are generated in water. These cavities arrive at a moment of local decompression and then close with a microburst upon the compression of water on microinhomogenieties inside the volume of the unit body with a frequency of several tens kHz. Due to the local sharp changes in pressure and temperature in the treated water, the pathogenic microflora is completely destroyed. In addition, active chemical radicals and hydrogen peroxide are formed. In the course of this process, fungi spores and bacteria serve as the aforementioned microinhomogenieties and thus become treatment targets. Moreover, the action of ultrasonic radiation in the volume of a liquid under treatment brings about the process of the volume degassing, that is, the appearance of multiple microscopic air bubbles. When evaluating the effectiveness of the method in point and the method of only UV irradiation with due regard to a degree of deactivating of pathogenic microflora (Figs. 1 - 4), one can see that under similar energy consumption (15 20 W/m3 for sewage) the effect of combined method is equivalent to 150 mJ/cm2; such a level practically cannot be reached in economically reasonable UV disinfecting stations produced by the companies of the USA, Europe, and Russia. 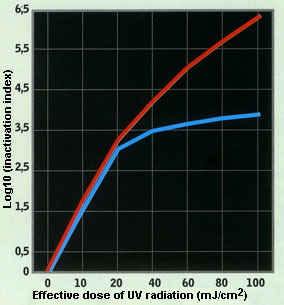 Similar effectiveness (Fig. 5, log NInlet / NOutlet = 5 – 6) makes it possible to ensure the undoubted reliability of disinfection at a level of 99.9999% for the nearest 20 – 30 years at commensurable expenses required for the construction of water and/or sewage stations that makes them attractive for any customer. 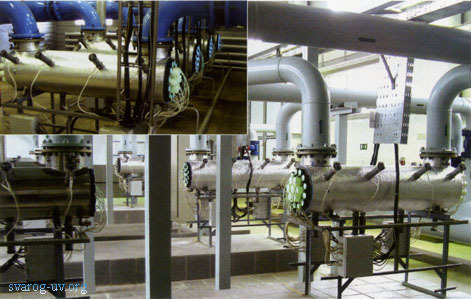 Appreciably lower demands with regard to the water transmittance (down to 60%) and to the amount of suspension particles (to 20 mg/l) and the lack of necessity in periodic cleaning of protective casings from the products of biofouling and sorarization are the significant advantages of these units. The testing of “Lazur” technology was carried out at the authorized centers of the Russian Federation , the Republic of South Africa, Australia , and New Zealand. These tests unambiguously confirmed the existence of the synergetic effect in the case of the simultaneous action of ultraviolet and ultrasound. This fact completely agrees with the conclusions of studies [ 13, 14 ]. 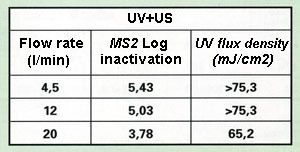 Thus, as follows from Table 1, the bactericidal effect of the estimated dose of UV radiation of 50 mJ/cm2 turned out to be equivalent to the action of 75 mJ/cm2 of UV radiation dose with respect to MS2 phage when ultrasound (US) was applied. 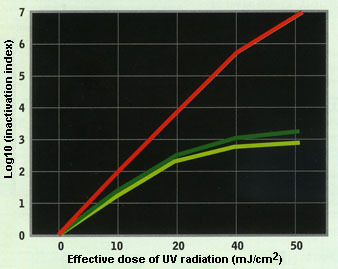 The analysis of testing results has shown that, under the simultaneous action of UV and US radiation, the effective dose of disinfecting with respect to various groups of microflora comprises from 100 to 150 mJ/cm2 at a value of physical UV dose of about 60 mJ/cm2 that also proves the high effectiveness of the proposed method of disinfection. The data of certification tests performed by the Australian Center of Water Quality Control during June – December 2007 on the “Lazur-M” unit for evaluation of the performance parameters are summarized in Table 2. It should be emphasized, that despite the reliably established experimental fact of the existence of toe synergetic effect under the conditions of simultaneous combined action of ultraviolet and ultrasound on water [11 – 14], the process itself still remains little-studied. This circumstance is explained by the multiple-factor character of the process, principle difficulties in its modeling in vitro, differences in the behavior of various types of pathogenic microorganisms and in the techniques of preparing of microbiological samples for experiments (the degree and parameters of dispersing, the estimates of dilution, etc.). Moreover, the experiments are very costly, laborious, and long-continued. Nevertheless, the deeper knowledge of the mechanisms and interrelations of basic parameters of the process in point will allow one to optimize both hardware and technological regimes with regard to the most strict requirements of water and/sewage disinfection. 3. Campbell A.T. (1995). Inactivation of oocyst Cryptosporidium parvum by ultraviolet radiation. Water Res., 29:2583. 4. Gwy-Am Shin, Zuzana Bohrerova, Karl G. Linden, and Gaetan Faubert, DNA repair of UV-irradiated Giardia lamblia cysts detected by both infectivity and molecular biological assays, Third International Congress on Ultraviolet Technologies, May 2005. 5. Methodical Guidelines 4.2.964-00: Sanitary-Parasitological Study of Water for Domestic and Drinking Usage; Moscow, 2000. 6. Methodical Guidelines 2.1.4.719-98: Sanitary Supervision of the Employment of Ultraviolet Radiation in the Technology of Potable Water Treatment; Moscow, 1998. 7. Methodical Guidelines 2.1.5.732-99: Sanitary-epidemiological supervision of the Disinfecting of Sewage under the Action of Ultraviolet Radiation; Moscow (1999). 8. “Kinetics of Microbial Inactivation for Alternative Food Processing Technologies”, Summary Report, U. S. Food and Drug Administration Center for Food Safety and Applied Nutrition, June 2, 2000. 9. Ahmed ElAmin, “ Combination treatment produces ultrapure water”, Technical Report, Mintel's Global New Product Database, 30/08/2006. 10. Method of Purification and Disinfection of Aqueous Media, Patent of the Russian Federation no. 2092448, 1996. 11. The Report of the E. Martsinovskii GOUVPO MMO (2007). The Testing of the Parazitocyd Function with Respect to the Protozoa Agents of Enteric Illnesses on the Bactericydal unit of “Lazur-M” Series produced by the JSC “SVAROG”. 13. Blume T., Neis U. (2004), Improved Waste Water Disinfection by Ultrasonic Pre-treatment, Ultrasonics Sonochemistry, V.11, № 5. 14. Blume T., Martinez I., Neis U. (2002), Wastewater disinfection using ultrasound and UV light, TU Hamburg-Harburg Reports on Sanitary Engineering, № 35.